Itz clean & comfortable although itz just nice the room size... Down stairs had a restaurant where the staff damn good, polite & good service too... I like it...! Location. The Indian food. The staff was very accommodating. The rooms were regularly cleaned. The room was nice. The receptionist was helpful and friendly. The staff were good. The restaurant was amazing food. Good local amenities. - we get refills of new shampoo, bottles of water & clean towel everyday. The staff were very helpful. Security was very good in the building. 24 hour front desk and English speaking staff. thhe price is affordable with the good condition of the room. OYO 724 Hotel Madras This rating is a reflection of how the property compares to the industry standard when it comes to price, facilities and services available. It's based on a self-evaluation by the property. Use this rating to help choose your stay! One of our best sellers in Kuala Lumpur! Located in Kuala Lumpur, OYO 724 Hotel Madras is a 17-minute walk from Putra World Trade Center. Located around 2.1 miles from Federal Territory Mosque, the hotel with free WiFi is also 2.7 miles away from Suria KLCC. The rooms include a flat-screen TV with cable channels. Rooms contain a private bathroom with a shower. Speaking English, Malay and Tamil, staff will be happy to provide guests with practical guidance on the area at the 24-hour front desk. Bank Negara Malaysia Museum and Art Gallery is 2.8 miles from the hotel, while Petronas Twin Towers is 2.9 miles away. 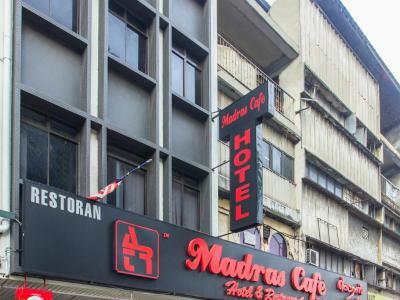 The nearest airport is Sultan Abdul Aziz Shah Airport, 16 miles from OYO 724 Hotel Madras. When would you like to stay at OYO 724 Hotel Madras? This family room features air conditioning and cable TV. House Rules OYO 724 Hotel Madras takes special requests – add in the next step! I don't have to say anything. There were no electricity for the whole night. Around 3am, I realized there were electricity in the area. Only at 7am, the electric were back. There were no room service. And it was noisy too. We could here the people at restaurant downstairs.